29 Mar 2018 - 25 Apr 2018 Srujanavani Skill Development Centre, Veeravilli Agaraharam, V.Madugula and Svln Zph school, Gopalapatnam, Visakhapatnam. 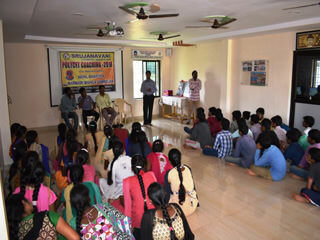 As is the case every year, even this year Free Polycet Coaching to students who completed their 10th standard education has taken place simultaneously at our Srujanavani Activity Centre – Gopalapatnam for urban students and Skill Development Centre – Vaddadi to cater to the rural students. Screening test was conducted to identify the students. Students from 6 schools (Urban) and 12 schools (Rural) have participated. 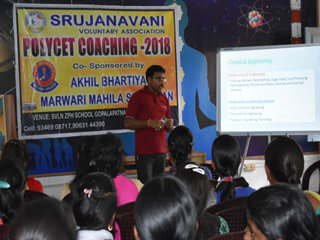 Out of the 700 students who partook in the screening process, a total of 125 students from Rural and Urban schools have been shortlisted for the Polycet Coaching. Daily classes spanning from 9am to 5pm were conducted by experienced teachers. These efforts would not have been a reality had there not been an unflinching support of our generous donor “Akhil Bhartiya Marwari Mahila Samiti” and other well-wishers namely Mr. Naveen Babu, Mr. Chandu Avinash, Mr. Maheswari, Mr. Anil Kumar, & Mr. Vamsi Krishna. Without their support these results would not have seen the light of the day. Apart from sponsoring the program they have graciously extend their support to participate in some of the sessions and explain the students on the importance of this coaching as a path to their success. Post the announcement of results, web counselling support has been extended to effectively guide the students to opt for better courses and Government Polytechnics offering the same. This initiative helped the students and their parents who attended the session to decide on the options available in a more informed way.